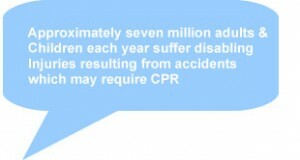 Every year in the UK, thousands of people die or are seriously injured in accidents. Many of these deaths could be prevented if first aid is given at the scene of the accident before emergency services arrive. Its so important that you learn basic first aid skills as it could save the life of a loved one, family member or friend. Could you assist someone in a medical emergency? First check that you and the casualty are not in any danger. If you are, make the situation safe. When it’s safe to do so, dial 999 or 112 for an ambulance, if necessary. Carry out basic first aid. If a person is not breathing normally after an accident, call for an ambulance and then, if you can, start CPR straight away.